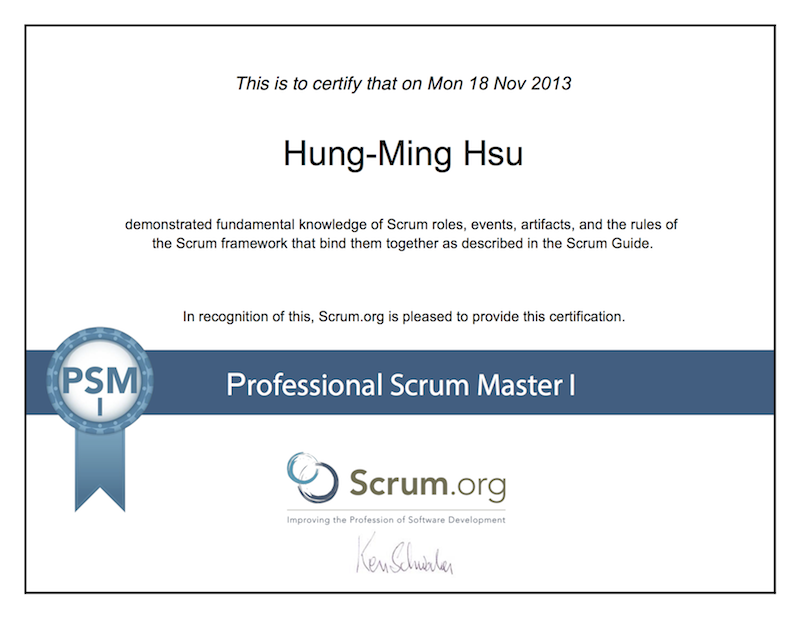 I have just recently passed my PSM I certificate test from Scrum.org. Luckily my score was 95% at first attempt so I would like to share my experience on preparing the assessment. I have got many advices from Derek Davidson, Eduardo Rodrigues Sucena, Krystian Kaczor and many other experts who have been practicing Scrum and Agile for many years. However your mindset of Scrum and experience would definitely make significant contributions for passing the PSM I assessment. Although there are many Scrum professionals around the world and many of them would doubt the necessity of having a Scrum Master certificate however, for me at least, the certification helped me to recognise my knowledge of Scrum. I have never attended any official training course so my knowledge is only based on my experience and reading articles. I believe many people have same background as mine so I hope this article will be helpful to people who want to pass the PSM I assessment. Before you continue, read the details of Professional Scrum Master I assessment first and you will have brief idea how the test works. The Scrum Guide is only a 16 pages guideline which contains the theory and definition of Scrum. I printed out the latest version of Scrum Guide and highlight keywords which I thought those are important to me. Believe it or not, it is simple to understand and doesn't take long to finish the whole guide but each sentence has its pregnant meanings. In my opinion, it is important to know what it says but more important to know why it says it. When I did my first open assessment test and it didn't go well, so I ask myself to go back to read the Scrum Guide to find out why. I was surprised that I couldn't find exact answers I want from the guide. However when I slowed down and thought about the meaning of the questions and answers on open assessment, then I understood the words in the guide. I have to say it looks easy but you need to change your mindset in order to master the Scrum. If you want to make yourself comfortable with the PSM I assessment environment, the Scrum Open Assessment would be your first choice. It is free and you can do it as many time as you want. My recommendation is to reach 100% at least ten times or until you could answer each question without looking at the multiple choice. "you should consistently be able to nail the Open Assessment with 100%. For each question, you should not only be able to determine *which* answer is the best, but also *why* the others are either wrong or not as good." However you may ask yourself that I am not confident on taking the PSM I test by only practicing open assessment. To be honest, you are not alone. I've visited many sites which are providing many sample questions but those resources are limit. There is only one site, testtakeronline.com, helpful to me but it cost me $20 to register it. In fact, you can also use their demo test to practice but it is limit so as open assessment from Scrum.org. At least, some questions on open assessment did turn up in PSM I assessment though. Anyway, the testtakeronline helped me to categorise the Scrum Guide and it helped me to concur some tricky questions. Again, it is just a tool to help you to pass the test but it may not be so helpful for you to master Scrum and Agile in real life. I had a shocking experience while taking my "first" attempt. The test site of Scrum.org had technical issues during the assessment session therefore I couldn't complete the test. But the Scrum.org did send me a new password to do a new assessment though. Anyway, there are few things you may need to be aware before pressing "Start" and these are recommended by Scrum.org. Scrum.org recommends to use Firefox or Google Chrome to do the assessment because they are more reliable for their test site. It is not easy to pass the PSM I assessment. There are some tricky questions occurred while taking my assessment. Scrum.org forum is also a good place to gain your knowledge. You can also refer to articles from Derek Davidson, Eduardo Rodrigues Sucena, and Krystian Kaczor to prepare your PSM I assessment. Please do let me know how these suggestions worked for you and wish your attempt successful. Remember Scrum is based on empiricism. Your knowledge comes from your experience. So Scrum on! your thoughts? Would that be worth the money spent professionally? I don't have a PMP certification to run projects but if the certification will assist you to achieve further goal of your career, why not? referred me to use the Guide to Scrum Body of Knowledge by http://www.scrumstudy.com. Genuinely scrum master are the people who are playing a very important role in software productivity especially during its development and i must say that is the way how we can learn through them because agile certified scrum master knows each and every aspect which brings out the best. I have joined the exam and got %81.3 and failed unfortunately, next week I will try again. I found that studying the Scrum Guide extensively was key. I also have some free sample questions on my site for a couple of the more tricky questions. If you take my full practice exam a few times with the Scrum Guide open, then take it for real until you get a 95%, you should feel confident you can get an 85% on the real exam fromScrum.org.